D J Norton playing on the railways. 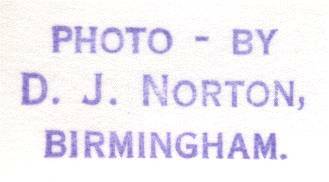 D J Norton - Dennis John Norton - was my father. Born in Birmingham in 1930, he suffered ill health throughout his life. He died from an asthma attack at the age of 35 in Ledbury, Herefordshire where my family had moved hoping that a country location may help alleviate the symptoms of his illness. He left my mother, brother (aged 4) and me still 9 weeks away from being born. Although I never met him I developed many interests that were similar to his - electronics, astronomy and photography. It was this latter interest that he left most evidence of. We have several hundred black and white photo's from the 1950's and 1960's that he took and developed himself. We also have several hundred full colour slides, also from the 1950's and 1960's. Many of the photographs are railway related - another great interest of his. The ones that captured my imagination were of Birmingham prior to and during the development of the inner ring road. It was these that inspired me to take these fascinating images out of their dusty old boxes and make them available to the world. This is a project that will take time to complete. My aim is to expand the site as and when time allows. Eventually I hope it will stand as a suitable memorial to my father and a life that was cut tragically short. If you take copies of the images here for your own use, a small donation to Asthma UK would be very much appreciated. Also, an acknowledgement of their source would help spread his name as an important photographer of his day. Information about the photo's themselves and the technical aspects of the project. The Inner Ring Road, City Centre, New Street Station and around the city. Various locations around the country. Updated as the site develops. An index of the site contents.